Casa de Internet for Latin America and the Caribbean was visited by distinguished personalities who came to Montevideo, the Uruguayan capital, to participate in the recent Ministerial Conference on the Information Society in Latin America and the Caribbean. 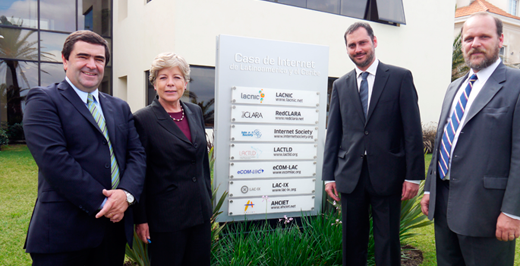 Alicia Barcena, executive secretary of the Economic Commission for Latin America and the Caribbean (ECLAC), was received at Casa de Internet by Raul Echeberria, Executive Director of Lacnic, Pablo Bello, Secretary General of AHCIET, and Sebastian Bellagamba, Internet Society Regional Bureau Director for Latin America and the Caribbean. The visit was an excellent opportunity for Dr. Barcena to have first-hand contact with an experience unprecedented in other regions. “The region needs an information society that is more active, more diverse and more interconnected, with greater interaction between public and private stakeholders,” said Barcena, highlighting the initiative that brings together seven of the continent’s Internet related organizations. Casa de Internet for Latin America and the Caribbean is a political hub that groups the headquarters of relevant organizations involved in the regional development of telecommunications, the Internet, and information and communication technologies: Lacnic, AHCIET, the Internet Society, CLARA, LACTLD, LAC-IX, and eCOM-LAC. Casa de Internet, which will soon be home to even more organizations, is an excellent example of coordination among institutions having different characteristics and interests, yet pursuing a common goal – working towards regional development. It should be noted that all of these organizations have strong ties with ECLAC, either through the Action Plan for Latin America and the Caribbean (eLAC), the organization of specific activities, or the Broadband Dialogue process, among other relevant experiences. In addition to Dr. Barcena’s visit, the eLAC meeting held in Montevideo made it possible for Casa de Internet to receive Ambassador Miguel Palomino, Chairman of the UN Commission on Science and Technology for Development; Monica Aspe, Information Society and Knowledge Coordinator at the Mexican Ministry of Communications and Transport; Belisario Contreras, program manager for OAS CICTE; Pedro Janices, Director of Argentina’s National Bureau of Information Technology; Elisabeth Hundhammer, European Commission Directorate General for Development and Cooperation; Mario Campolargo, European Commission Director for Net Futures; Janis Karklins, UNESCO Assistant Director-General for Communication and Information, and Guilherme Canela, MERCOSUR Adviser in Communication and Information.